Kris Ehler of Ehler Brothers Co. examines his test fields in Thomosboro, IL. Kris Ehler of Ehler Brothers Co. in Thomasboro, Ill., has advised multiple yield champions over the years, specifically Illinois’ soybean champions the past three years. 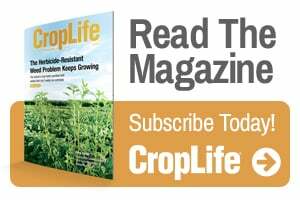 So, he believes he knows the key to ensuring soybean plant yields are maximized at every stage of the growing season. In fact, he personally tests products in his own fields in order to make the best recommendations based on his customers’ specific needs. Much of the success he’s seen has involved Stoller’s Start–Grow–Finish program. 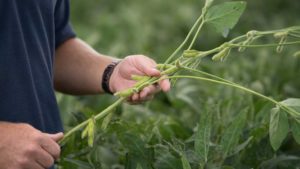 “Stoller’s Start–Grow–Finish program utilizes products that will optimize that plant’s performance along the way, whether it’s root growth, vegetative growth, flowering and/or kernel set, and harvesting that plant at the right time,” said Ehler. During the Grow season, achieving optimal plant performance has as much to do with when you apply foliar products as what products you apply, and Ehler believes in two key Stoller products for this phase: Harvest More® Urea Mate and Bio-Forge® Advanced. Retailer/Grower Kris Ehler examines the development of one his soybean plants at R5 following Stoller foliar treatments. Harvest More Urea Mate 5-10-27 is a total plant food package including the key micronutrients boron, calcium, cobalt, copper, magnesium, manganese, molybdenum and zinc. Essentially, Harvest More Urea Mate provides the plant access to each of these different nutrients and allows plants to select exactly how much they need at different times. Its convenient formulation allows it to mix easily with other products, and Harvest More Urea Mate can be added to foliar sprays throughout the season, offering a cost-effective method to ensure your crops are nutritionally balanced with no yield-robbing deficiencies. Kris Ehler discusses his crop development with a Stoller plant growth expert. Bio-Forge Advanced helps the plant manage abiotic stress, promotes nitrogen metabolism so that the plant can benefit from applied nitrogen, and makes soil-bound nutrients available to the plant. This means that your plants can use their energy to grow instead of using it to manage environmental stress. Ehler also noted that his crops experienced high environmental stress due to hot and dry conditions last season, but applying Harvest More Urea Mate and Bio-Forge Advanced during the most stressful part of the growing season resulted in efficient plants and high yields. 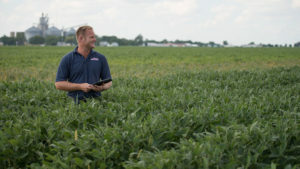 The Start–Grow–Finish program from Stoller helped Ehler build yield champions in Illinois, but it can help any farmer break their own personal yield record. If you’re interested in learning more about Harvest More Urea Mate, Bio-Forge Advanced and Stoller’s complete portfolio, visit StollerUSA.com or contact your Stoller representative.